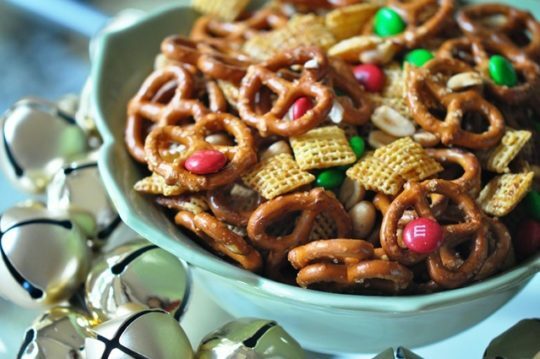 This is Holly Clegg's FAVORITE snack mix recipe that’s simple and fantastic with a mixture of savory and sweet. With seasonal M&M’s, this festive recipe is hard to beat. It makes a great snack, gift or perfect for the munchies. This recipe is from Holly Clegg’s trim&TERRIFIC Eating Well to Fight Arthritis cookbook. Preheat oven 250°F. Line baking pan with foil. In small bowl, whisk together sesame oil, honey, soy sauce, and garlic powder. On prepared pan, combine cereal squares, pretzels, and peanuts. Add oil mixture and toss with cereal mixture. Bake 25 minutes, stirring once. Turn off oven and remain in oven 1 hour to continue crisping. Cool completely and toss with chocolate candies. Store in an airtight container. Terrific Tip: Use seasonal chocolate candies for the different holidays. Leave out the chocolate candies and add dried cranberries, if desired. Or, the mixture can be made without either. Recipe from Holly Clegg’s trim&TERRIFIC Eating Well to Fight Arthritis. For more of Holly's healthy recipes and tips, visit her YouTube channel, website and blog.